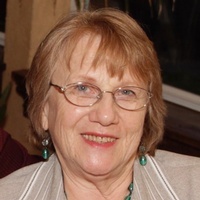 Sylvia Ann Kvapil Rohmfeld, age 79, passed in peace on Sunday, February 3rd, 2019 in San Antonio, Texas. A gentle and kind woman who spent her life in service to others, whether it was taking care of her husband, children, grandchildren, mother, father, friends or strangers, Sylvia could be found with a smile on her face and a kind word to be offered. The world was a better place with her in it and anyone who crossed her path was fortunate to have been able to share the moments with her. She grew up on a farm in Rowena Texas in the 1940’s and 50’s as the daughter of hard working, proud 1st generation Czechoslovakian-Americans. Married the love of her life, Fred (Bugs) Rohmfeld, in 1958, raised a daughter and son along with two grandchildren. Working and helping others throughout her life, Sylvia spent the last 10 years volunteering and making new friends at Casa Helotes. Preceded by her parents Charlie Kvapil and Vlasta Pospichal, Sylvia will be remembered with great love by her husband Ferdinand (Fred) Walter Rohmfeld, daughter Wanda June Landry and husband Mitch, son David Joseph Rohmfeld and wife Kathy Andersen, brother James Daniel (J.D.) Kvapil and wife Mildred (Millie), sister Elaine Marie Mucha and husband Fredric, granddaughters Sarah Danielle McLeod and Eryn Kate Normandy, and numerous cousins, nieces and nephews. A visitation will be held at the Lange Funeral Home on Thursday February 7th at 6pm followed by a graveside ceremony at the St. Josephs cemetery in Rowena, Texas on February 8th, 2019 at 11 a.m.. The family has designated the Casa Helotes Senior Citizen Center at https://casahelotes.org/ for any memorial contributions in remembrance of Sylvia. The family would like to thank the Kindred Hospice facility for their care and compassion.